Donation Drives - this the season to GIVE, GIVE, GIVE! Tis the season to give, give, give!! PSP has worked with Little Essentials (LE) over their 6 year existence. The Toy Box Drive will focus on Brooklyn kids under 10. More locations to be added… Stay Tuned! About LE: LE improves the health, safety and wellbeing of children living in poverty by providing urgently needed resources and parenting education to families in crisis. About Sheltering Arms: Sheltering Arms is a New York City-based social services agency that offers support to nearly 25,000 disenfranchised children and families throughout the city each year. Our critical programs strengthen the education, wellbeing, and development of those most in need, and through innovation and partnerships, we enable low-income children and families to take steps toward brighter futures. In Brooklyn, Sheltering Arms operates a number of Early Education facilities for families who live below the poverty live, and our high-quality programs offer a safe, supportive environment for children to help them gain the skills they will need to succeed in Kindergarten and beyond. 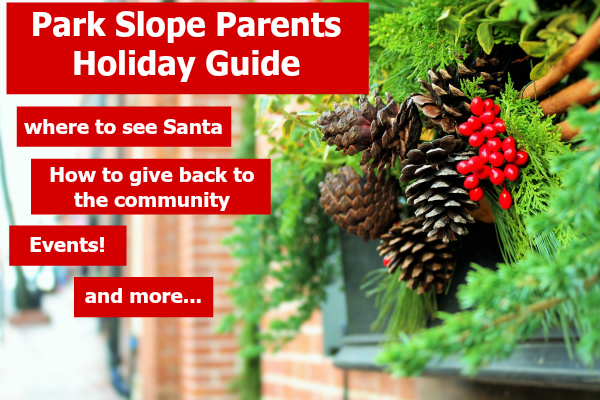 This year Park Slope Parents is teaming up with Lantern Community Serviceson a Holiday Gift Drive for teens and young adults who are impacted or threatened with homelessness. PSP has been reaching out to our TWEENS group because the folks who are in need are teens and young adults. Let's try to fulfill their wish to have 150+ gifts donated. Your kids can help pick out the gift they want to give from their wishlist here. About Lantern Community Services: their mission is to champion the independence and well-being of New Yorkers who are impacted by or threatened with homelessness. More than 2,000 adults, children and youth call Latern's apartment buildings home. These young adults have been homeless or in foster care, and many live with mental illness, addiction, or disability. The families Latern serve struggle on very low incomes, and many of our youth don’t have families to turn to at all. This means that these teenagers and young adults often go without a gift at the holidays. CHiPS Paper Goods Drive - now through 2017! Drop Off Location/Date: 200 4th Ave (at Sackett), daily from 9am – 8pm and for more information, contact: or (718) 237-2962. About CHiPS: Since 1971, CHiPS (Park Slope Christian Help, Inc.) has been a community of Brooklyn neighbors, volunteers, and friends who share a common spiritual vision to help those who are less fortunate. They prepare hot, nutritious meals and serve them to the needy in a caring and respectful environment. In addition to meals, they offer seasonal clothing, emergency pantry items, and shelter for young mothers and their children. Their dedication to service goes beyond basic needs in the hope that all our disadvantaged brothers and sisters may find independence and the strength to meet life’s challenges. All their services are offered free of charge through the generosity of our community of donors. Can you spare 5 (or more) bucks to a pregnant or new mom at a shelter? CHiPS is also asking for gift cards this year. To send a gift card, got to:http://bit.ly/PSPTargetGifttoCHIPS, select the amount you would like to donate and the email for delivery is . Pay (they even accept Paypal), and WHOOSH! Done—the gift card will be emailed to Denise at CHiPS and she’ll distribute equally! Denise can also send you a donation letter if need be. It took us less than 2 minutes to do this. Drop Off Location/Date: 153 E 3rd St, Brooklyn, NY 11218 between 11 a.m. - 7 p.m. If you’d like to volunteer, the next orientation is December 8th 7pm (and are rotating the 2nd and 4th Thursday of each month). Kids 12-16 can volunteer for small animal care. Those 16+ can walk and care for dogs. What: If you’re interested in volunteering (adults only) on an ongoing basis, please attend one of these orientation. Email for more information. What: Each appointment includes a five minute session with Santa Claus and lots of images sent right to your Inbox. Cost: Photo packages run from $19.95-$39.95. When: now - December 24, 2016, times vary; please see the schedule for details. Closing time is 9pm every night through Dec. 23. Please note that Macy’s Santaland will close at 4pm (sharp!) on Christmas Eve. What: Santa is stopping by Macy's! It's the perfect opportunity to share everything on your holiday wish list. He's only here for a limited time, so catch him while you can! Have your photo taken with the man himself! You may reserve a spot on their Express Pass line free of charge at macys.com/santaland. Reservations are subject to availability and can only be made 30 minutes to 48 hours in advance. Cost: It’s free to visit! Professional photos are available for purchase, but they’re optional. Packages start at $20.99. What: Santa will be available for photos and visits at his winter home, located Upper Level, near Best Buy. Reservations available, but not required! When: Sunday, December 18th, 12:30 p.m.
What: Are you Ready to Show your Wrapping Skills? It's that time of year again. We will wrap holiday presents for children enrolled in our programs. Enjoy light refreshments, great company, and the knowledge that you will be making the season brighter for our kids! Please bring wrapping paper (and your Holiday Hats!). To learn more about Sheltering Arms and their Holiday Gift Drive, please visit their website. RSVP HERE. Kids of ALL ages welcome! What: Brooklyn Bowl will become it's own snow globe! There will be holiday themed photo booth, a rock band singing all the top 40 hits, and a sing-a-long with Santa, and more. What: Celebrate Chanukah with food, wine, crafts, games, a magic show. They are collecting new or gently used toys and books for children living in homeless shelters and the Brownsville Housing Projects (distributed by Bishop Billips from the Church of Faith, Hope and Charity). Cost: free, everyone is welcome. What to bring: $20 dollar suggested donation and a new, unwrapped present for a child. What: 5th Ave BID are collaborating with Lullaby Baby and Chabad Park Slope in doing their first Menorah lighting on 5th Ave. Come on down and enjoy some refreshments, get a free Chanukah toy. Thanks to The Old Stone House for supporting this event! What: Join the Prospect Park Alliance and Brooklyn Borough President Eric L. Adams for this 37th annual fireworks celebration, this year with a twist! Help us kick off the celebration of the Park's 150th anniversary with more spectacular fireworks fun, and live entertainment starting at 11 pm. Locations for viewing the fireworks include Grand Army Plaza, the Park’s West Drive, and along Prospect Park West between Grand Army Plaza and 9th Street. RSVP to let us know if you are coming, and share your pics with hashtag #ProspectPark150!